We returned to Winnipeg and were bused to the Inn at the Forks, a very ritzy (by my standards) hotel in the Forks area of Winnipeg. As I mentioned in another post , the Forks refers to where the Red and the Assiniboine rivers combine. We would be spending the night here before moving to the hotel where we stayed when we first arrived in Winnipeg. 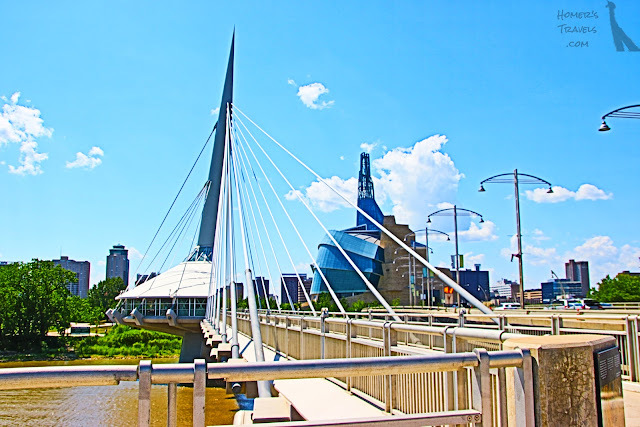 The next morning we checked out and left our bags at the the Inn before walking over to the pedestrian bridge that crosses the Red river and connects Winnipeg proper and the St Boniface district. On this bridge is the Mon Ami Louis french restaurant (I posted a picture of it in this post). We stopped here and had lunch since ... how many times can you say you ate in a restaurant on a pedestrian bridge. The place was very nice. We were the first to be seated and we had a very tasty lunch. 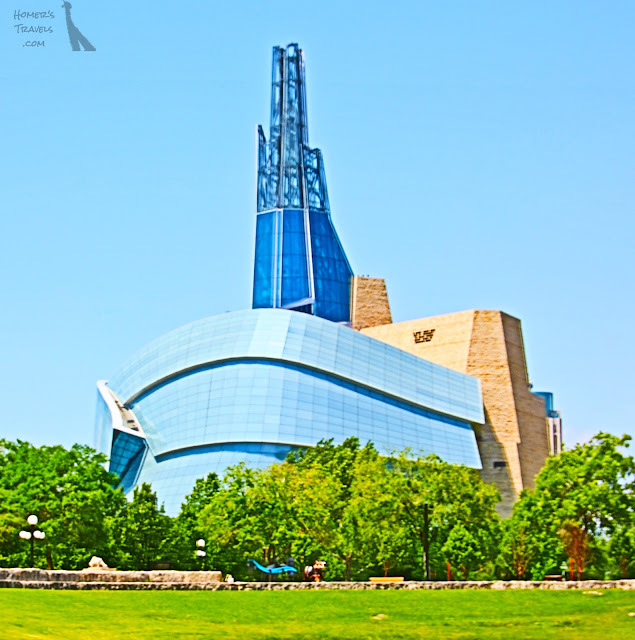 Mon Ami Louis restaurant and the Museum of Human Rights. We completed our walk on the pedestrian bridge and found ourselves in St Boniface - the french district of Winnipeg. 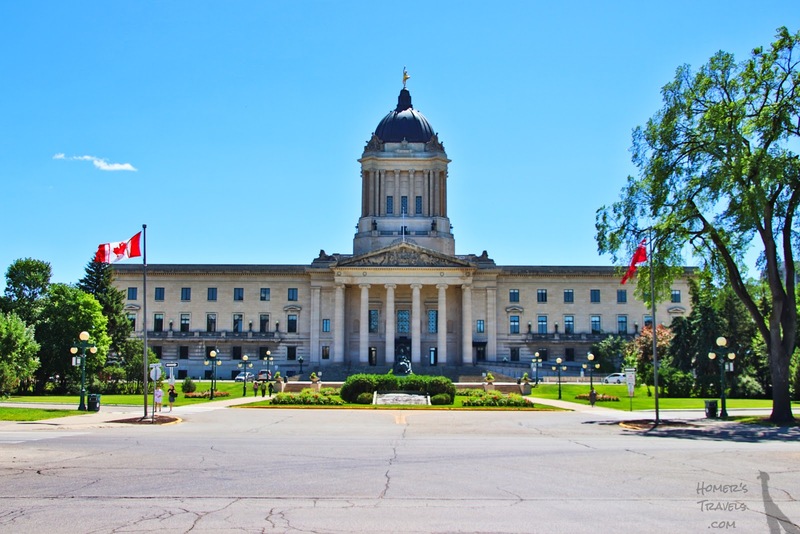 St Boniface was once an independent city but, due to lack of growth, joined with Winnipeg. In this area there are all french schools and colleges. French is the primary language used at home. French restaurants abound. 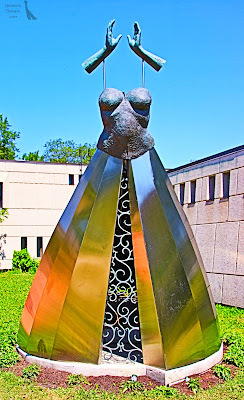 We walked to the old city hall and sat down in the shade in a small sculpture garden. We were planning to take a walking tour of St Boniface but we were a little early. It was very comfortable in the shade with a strong, cooling breeze. In the sun it was broiling. 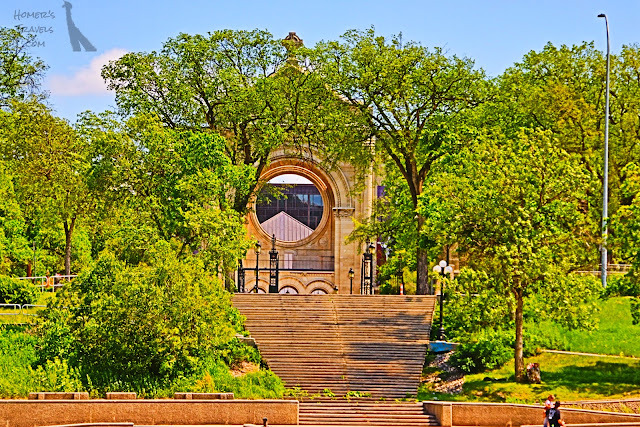 We were the only ones on the walking tour today and our college student took us on a short walk through St Boniface. I think our guide was a little short on the history of the area but made up for it by giving us the perspective of a young immigrant Canadian (she was from the Congo). The tour ended at the St Boniface cathedral. The old cathedral had burnt and when they built the new one they kept the shell of the old intact. I was hoping to get good pictures but they were preparing for a church festival of some sort and scaffolding and banners obscured much of the old cathedral structure. I did manage to get a picture from the water taxi tour earlier in the week. By the end of the tour we were very hot and dripping with sweat. We made our way back to the bridge and bought a couple bottles of water. We headed back up the street to a Chocolatier Constance Popp and indulged in some ice cream to help cool our overheated bodies before heading back to our hotel, got our bags, and taxied over to our other hotel where we would spend two more nights. Façade of the old St Boniface cathedral. As we checked in the Wife was starting to not feel well. She thought it might be allergies. It probably was a cold since it lasted a few days. On Saturday we slept in to give the Wife some time to heal before we walked over the the Museum of Human Rights. 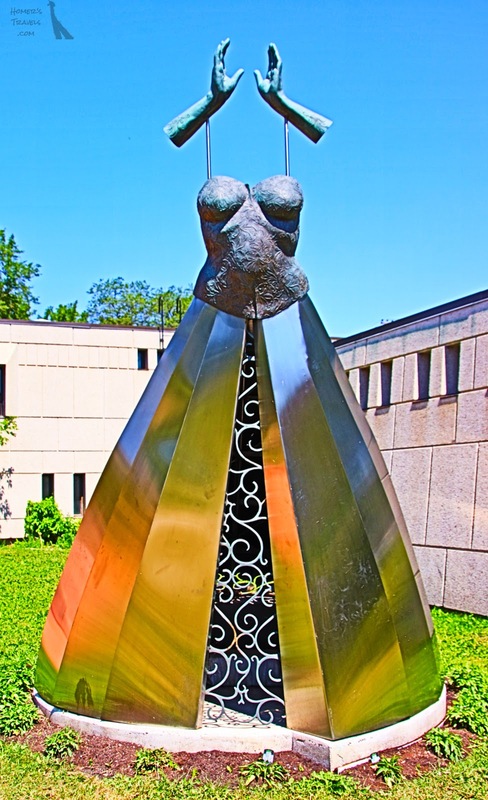 The museum is housed in a very interesting building. There are seven levels to the museum connected by long ramps. As we moved up we learned about human rights struggles in Canada and the rest of the world. By the fifth level the Wife was starting to wear down and she was cold and clammy to the touch. We switched from ramps to elevators for the last two levels before heading up to the eighth level observation deck. The interesting Museum of Human Rights building. We took the elevator down and had lunch in the museum bistro, bought some magnets, and returned to the hotel so that the Wife could get the rest she needed. I did laundry. On Sunday we were supposed to leave at 10:30 pm on the train. We decided to extend out hotel stay so that we could wait in comfort. We expected the train to be late and we were not disappointed. I did one more load of laundry, watched the World Cup finals (the french district was in a very celebratory mood after France won), and went for a short walk. A front went through overnight and the temperatures were much more comfortable today. 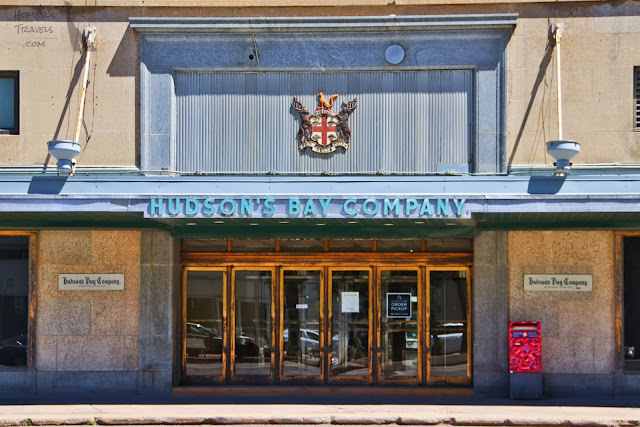 The Hudson Bay Company founded in 1670. We checked out of our hotel at 10:00 pm and walked to the train station. The train was roughly five hours late. This would cut into our limited time in Toronto. It felt good getting out of Winnipeg. It’s a nice city but the train schedule had forced us to spend too much time here I think. Photographs can be found in my 2018-06 Canada By Rail Google Photos album.